OKOKO belts for men are the epitome of elegant form meeting practical function. 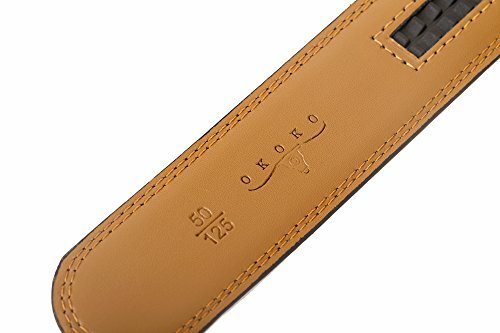 The combination of expert construction and contemporary style is what makes OKOKO belts for men exclusive. 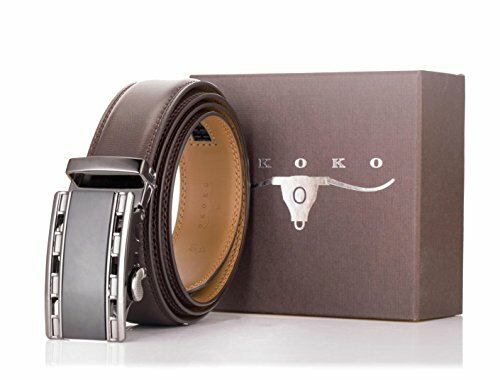 OKOKO creates fine crafted auto lock belts of extraordinary comfort, durability and functionality. 1. 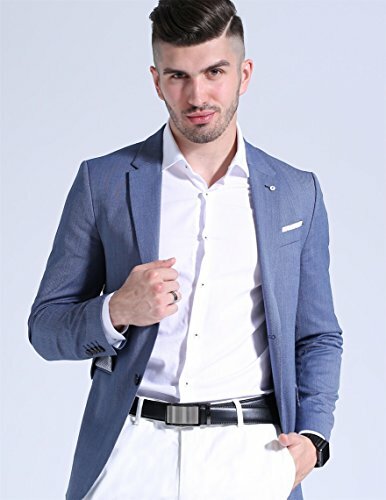 To loosen the ratcheting belt from buckle- firmly push the click belt forward inner way in adjustable belt buckle and closure will lift on its own. 2. 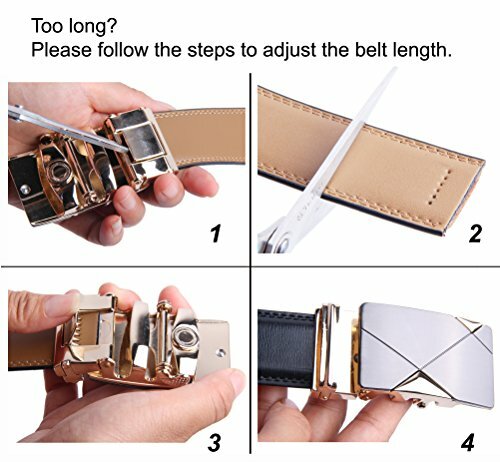 Cut the leather belt to your desired size and secure it firmly with closure. You're no longer restricted to 1-inch size adjustments, but can get a perfect, and custom-fit all the time! Customer satisfaction is our mission.OKOKO is here to provide our esteemed customers a most pleasant experience. Our 60 days return policy, plus 180 days warranty, enables you a risk-free purchase! 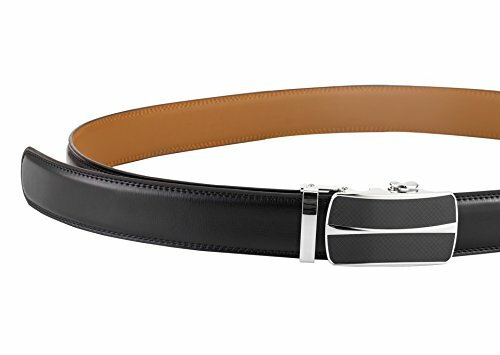 NO MORE HOLES - OKOKO Ratchet Belts provide 38 unique adjustments for a superb comfortable fit. Easy removable buckle allows you to cut the belt to your ideal size to give a primmer and custom tailored appearance! EASY USE - Just slide the belt into the buckle and pull the belt through, the buckle simply auto locks the belt, to release the belt, gently push the lever on the side of the buckle and lock will snap. Simple, smooth and sleek! 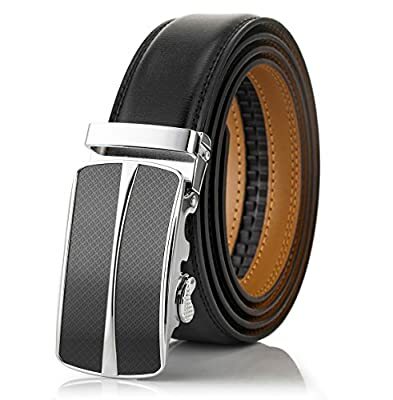 MAXIMUM DURABILITY - belt strap is 3.5cm wide,which is presenting the perfect look of a fine, genuine leather quality designer belt for men, complemented with a highly fashion stylish and interchangeable buckle that is elegantly designed with class. Scratch resistant durable buckles made to last. GIFT BOX - Make a big impression! Fashion men belt is enclosed in a lovely, attractive gift box. ORDER WITH GRACE - 100% satisfaction guaranteed, 60 days free exchange and returns plus 180 days warranty.